Home News Now you can install Ubuntu on your Windows 10 in one click. Finally, the wait is over of many people, now you can finally use Ubuntu in your Windows PC, without doing a dual boot and running on any kind of virtual machine. 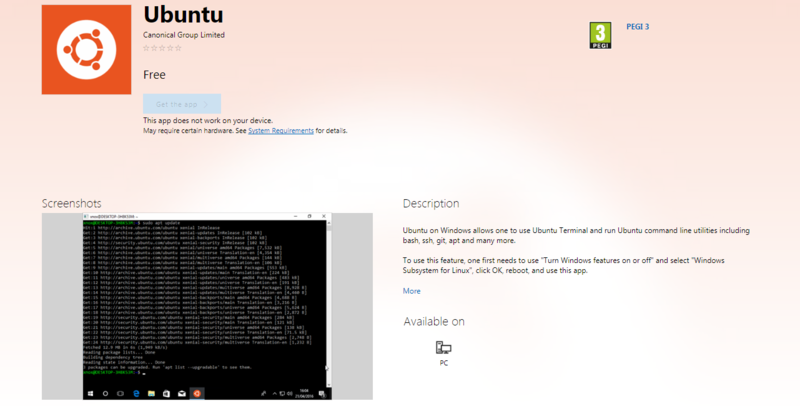 You can install Ubuntu on your Windows 10 PC like as any another application. Microsoft completed their promise of adding Ubuntu in the Windows Store. It is live in UK, US, and many other countries too. This feature is launched on the occasion of the Windows 10 Anniversary update. You cannot do all the things which you can do with the original Ubuntu but yes it is better of having something rather than nothing. It is sandboxed (it has limited interaction with Windows) and is focused on running command line utilities like bash or SSH. Two other Linux based distros are coming in the Windows 10 store OpenSUSE & Fedora. If you are a part of Windows Insider program then you can just simply go to the store and download the application and if you are not a part of that program you need to do some changes in your settings to download. You need to first go to the Control Panel (not the newer Windows 10 Settings app) and then select the “Turn Windows features on or off” menu, then you can see the “Windows Subsystem for Linux,” select it and do a reboot. Then you can download and use the Ubuntu on your Windows 10 computer. Previous articleFacebook hacking hoax is spreading worldwide. Next articleIntel i9 processor is the best processor ever made.